Hello everyone, today I've another empties post for you! I've been trying not to throw out the stuff I've used up the last few months for this post. I did forget and throw out a few things, but they were mostly shampoo and conditioners, and I've been using the same ones for a while so its no biggie. If you read my first empties post, and I think one of my favourites post from last year, you'd know how much I love this range! The shampoo and conditioner are amazing, and so is this curling cream. It's the only product I've ever tried that's really ever made a difference to my frizz! Will I repurchase? Already did, but I'm almost out again, so it'll be time to pick up another one soon! I was late to the Micellar Water bandwagon, but better late than never right? I really loved this stuff, it does a great job of taking off makeup. I've had this bottle for absolutely ages, a little really goes a long way with this stuff! Will I repurchase? I put off buying this for a while because as much as I loved it, I started using an oil cleanser by L'Oreal which I liked a lot better. Recently though, I picked up a little bottle of Bioderma Micellar Water and am going to pick up a small bottle of this too, so I can do a comparison! I got this in a Memebox back in September or October, but didn't really use it much until December, before stopping again because the smell started to make me feel slightly nauseous. It is a really hydrating cream, but the smell was just getting to me. It's not that it has a bad scent though, I actually think it smells quite refreshing, it can just be a bit overwhelming. I started using it again in March and thankfully didn't have the same problem with the smell. Will I repurchase? No. I prefer my Etude House Collagen Cream to this and will continue to use that. This featured in my last empties too, and I still love it! It's specifically targeted towards those in their 20's, like myself, it's really hydrating and leaves my skin feeling great. Will I repurchase? I have another one that I'm using right now, but I'm almost out. Need to go pick up another next time it's on offer! I can't live without a tube of Carmex or Hand Food with me at all times. My lips and hands tend to get quite dry, and both these products help keep them soft and hydrated! Will I repurchase? I bought 3 tubes of Carmex a while back because they were on a 3for2 offer and I tend to go through them so fast that it's a nuisance having to go out and get a new one every time I finish. So basically, I'm all set for a while on the Carmex front. I have a backup tube of Hand Food too, and will probably get the full sized one next time. What's In My Makeup Bag Tag! 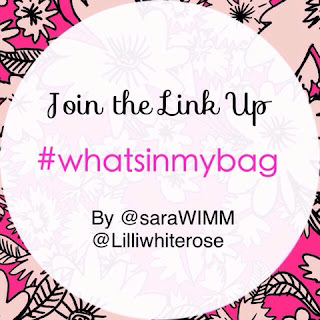 So, following on from last weeks What's In My Bag Tag, I have my What's In My Makeup Bag Tag post today. To be honest, I don't really have an everyday makeup bag, I store my brushes, mascaras and lip/eye pencils in mugs, and I have a little plastic lipstick holder for my most used lipsticks. Everything else is in IKEA boxes in a shelf in the bookcase. I find it's quite easy to grab whatever I need so I don't really see the point in putting stuff in a particular bag, even if I use it regularly. I don't really like carrying them around in my handbag either, usually I just toss in my lipstick/lip liner and I'm good to go. When I travel though, I do bring a makeup bag with me, and that's what I'm showing you today. The contents of this bag are usually always the same, with one or two products being changed now and again. I was staying in Cavan last weekend at a friend's, and this was what I had in my makeup bag. 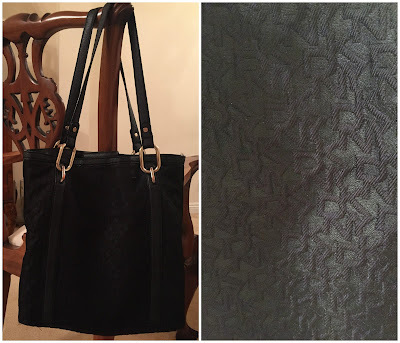 The bag I like to use is this one that came with the Urban Decay Vice 3, mostly because I really like the size of it: not too big and not too small! These are the face products I brought with me: sunscreen, my favourite serum (L'Oreal Skin Perfection), my Max Factor foundation, the Nyx Dewy Finish Setting Spray and my Real Techniques Sponge (I promise it's clean, I can just never get the stains out!). I would usually just bring the one blush with me, but I had a party to go to on the Sunday and wanted a few options because I wasn't sure what I wanted to do my face like. I brought along my favourite Max Factor blush (shade is Alluring Rose), my MAC blush (Mocha) and my Milani blush (Luminoso). The brush I use is the Pink Avenue Contour Brush. For my eyes, I brought my Naked 2 and Chocolate Bar palettes with me (again, had no idea how I wanted to do my face), but those I just kept in my overnight bag as they obviously wouldn't fit in the makeup bag. I also brought my Zoeva Brushes with me, but they were in a separate bag. What I had in the makeup bag was my Maybelline Master Drama Kohl Liner for my waterline, my Collection pen liner, my Benefit Roller Lash and Maybelline Miss Manga mascaras (Benefit for length, Maybelline for volume) and my Innisfree eye primer. The last few things in my makeup bag were my lip products. MAC's Soar is my all time favourite lip pencil, so I brought that. I also really love the Spice liner and Brave lipstick, and just got Velvet Teddy so I brought that too. That's all that was in my makeup bag, hope you enjoyed having a peek! If you want to have a look through some of the other post's in this linky, you can find them in Danielle's post by clicking the image below! With all the hype over the Sigma Mat the last few months, I was hearing a lot about the little Brush Egg too, and decided to get one to try out. Washing makeup brushes can be such a chore for some and the Brush Egg promises to make the whole thing a lot quicker. I have to confess, I love washing my brushes, but I do get a bit fed up when I have a load of them to clean in the one go so I thought I'd try this out. It's really simple to use. All you need to do is put some soap/shampoo onto the the ridges, wet your brush, rub it through in the shampoo in the ridges, rinse and repeat one or two more times. You can see all the makeup coming right out, leaving you with nice clean brushes, but a lot more quickly. 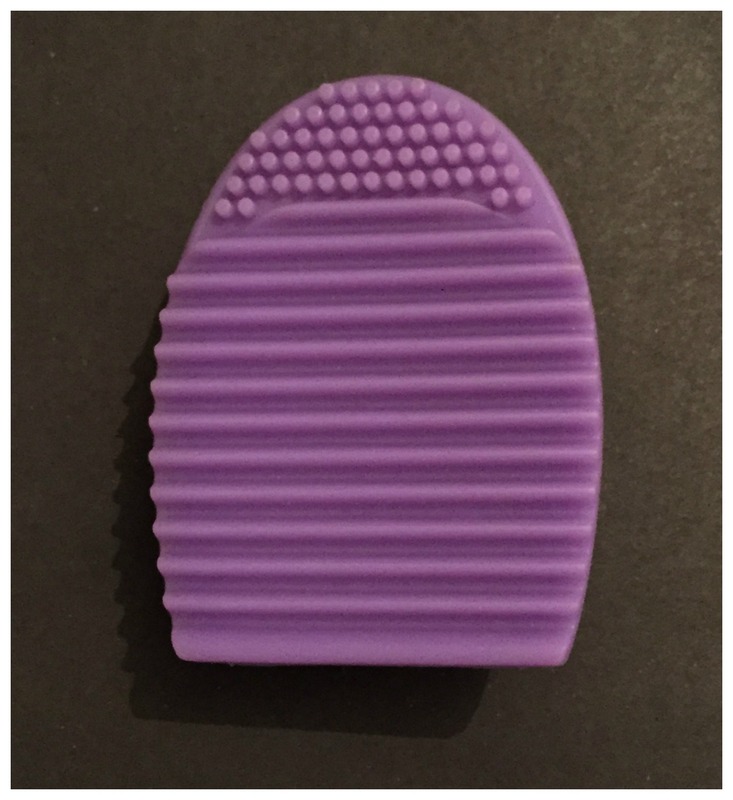 The lined part is for bigger brushes, like foundation or powder brushes, and the dotted part at the top is for smaller brushes like your eyeshadow brushes. I found that the Brush Egg is much better for cleaning big brushes, it takes all of the makeup out without a hitch, and super fast. I've cleaned my powder brushes, foundation brushes, blush brushes etc. with it, and it took less than a minute to do each brush. Personally, I don't like using it for eyeshadow brushes. I don't think it get's all the products out, and I'm afraid of ruining the brushes by scrubbing a little harder. There's always a little bit of eyeshadow left on the tip of the brush, which comes out really easily if I was the brush the usual way. 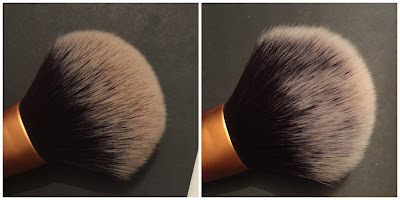 Below you can see the brush before I washed it, after using it with the Brush Egg, and after washing it again the normal way. There's still a pink stain at the tip of the brush after using the Brush Egg. 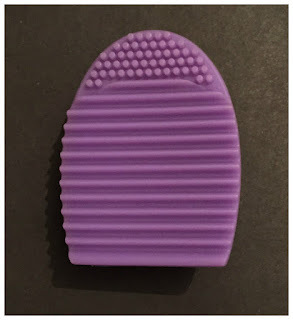 Overall, I do love this for my face brushes, I think it works great for them and I'd still highly recommend it because of that. I don't think it's too great for the smaller brushes, but that's just me: other people seem to love it for the eyeshadow brushes too. Either way, it's really cheap and if you end up hating it, it won't have set you back too much. I got mine on eBay for around €2. What's In My Bag Tag! Hey guys! It's been a while since I blogged (you can blame college for that!) but it's summer now and I should be able to go back to my old routine of two posts a week (I'm starting my internship this week but I think I'll still be able to keep up with my posts!). I was cleaning out my handbag earlier and thought I'd join Sara's linky and show you all what I carry around with me in my bag. So let's just jump in, shall we? First off, the bag itself. I've had this DKNY bag for a good few years now and even though I've newer bags, I use this one the most. It's black, so it goes with everything, and it's the perfect size for everyday use. Now, onto what's actually in the bag. Besides the obvious phone/wallet/headphones/keys, here's what I keep in my bag at all times! The essentials: I always have a packet of tissues with me, my good ole' Hand Food by Soap and Glory, my Carmex (I never leave the house without this, no matter what), and some perfume (this one is a L'Occitane rollerball one). Bandages are a must for me, I seem to have really bad luck when it comes to pumps. I don't wear pumps often but I always need to have a load of plasters in the bag because I forget to put them in when I do wear pumps. I shocked myself when I was cleaning out the bag and found a trove of pens and highlighters, but in fairness, I did just finish exams and it's easier to chuck a new pen into the little pocket everyday than it is to dig down to the bottom to try and make sure the one from the day before is still there. I usually only carry around one or two pens, but for exams I needed to be prepared for the extremely unlikely that 4 out of the 5 I bring in will run dry. Another great shocker came from how few lipsticks I had in the bag. Usually, I've at least 5 different lip products in the bag, 4 of which I'd usually only have worn maybe once in the preceding 3 months or so (like the Tony Moly one in the picture, I wore that once back in March and haven't touched it since). My most used lipsticks are Gerard Cosmetics 1995 (pictured above) and Mac's Brave, so at least one of those is always in there. Finally, I always have a massive stash of receipts being crushed at the bottom of the bag, which is the main reason for the cleanse earlier. I'm too lazy to stuff them into the wallet, and also too lazy to take them out ever again. So that's all that's in my bag. If you want to have a nose through some of the other posts, you can find them in Sara's post by clicking on the picture below!